Standing up to a racist fascist movement when it is still small enough to start seems to make sense. Antifa is an umbrella term uniting people who commit to doing so aggressively, as (at right) in Berkeley in April. Of course, figuring out who’s a fascist and how to stand up to them effectively is at least a little more complicated. A strong moral stance against racism and/or fascism doesn’t immediately justify any and all tactics of resistance. Here I’m less concerned with the moral debates about the nature of evil or the ethics of violence than in the political effects of different movement tactics. 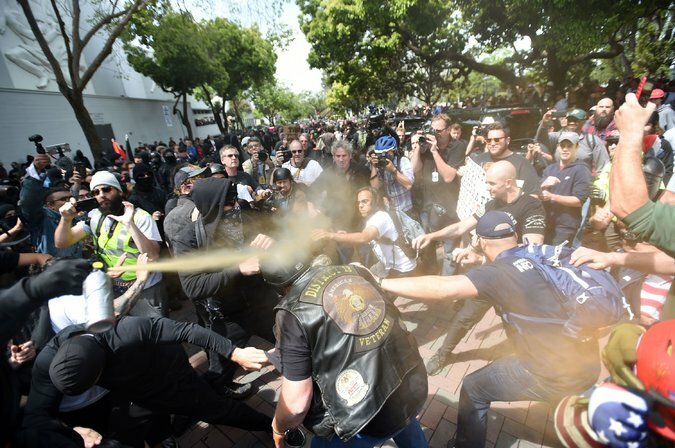 Determined to keep the Bay Area safe from offensive conservative provocation, like speeches by Milo Yiannopoulos or Ann Coulter, antifa activists have worked to attack their hosts and command the streets. Because visits to Berkeley might generate confrontation, photos, and attention, the Bay Area has become the indispensable spot on the book tour of any conservative. I’d code Yiannopoulos and Coutler as offensive and opportunistic, and advocates of policies that would hurt many people–but they were unarmed. That’s not the case with the Nazis and Klansmen who have been turning up at white nationalist events. When the Unite the Right rally came to Charlottesville, providing a jamboree for the racist right, antifa activists appeared as well, determined to do more than exercise moral suasion. Carrying sticks and deploying pepper spray or mace, antifa worked to meet the threat aggressively, and to protect nonviolent marchers. Several ministers credit the antifa with saving their lives during the demonstrations (e.g.). Antifa protest gives the young and committed something to do to stand up against what’s wrong. Let me acknowledge all this before explaining why I think that violent confrontation of the racist right is a poor strategy, and one that is likely to be counterproductive. First, control of the streets in the United States will not be decided by the strength of the battle between committed (and mostly poorly trained) paramilitary forces. Police and (if they fail) National Guard are far better armed and trained than activist forces on the left or right. Streetfighting invites their intervention. At best, this means active repression that will always advantage those in power. But it could be much worse; cautionary tales abound. Think, for example, of the militarized suppression of protests against police violence in Ferguson, Missouri. Putting young committed people, perhaps masked, in the sites of scared or angry police forces–or the judicial system for that matter, hardly represents a risk worth taking lightly. Moreover, armed protesters effectively invite that repression for even the unarmed and nonviolent around them. Obviously, this makes growing a movement tougher. Second, battle ready and aggressive protesters will always command the most public attention, no matter how large their presence at an event. Oppositional media will focus on the images most offensive and terrifying to their audiences. Mainstream media will focus on the most dramatic story. Street fighting and injury will trump other tactics every time. Ultimately, this kind of coverage exaggerates both the size of the antifa and the power of the racist right they are confronting. Third, antiracist violence offers both journalists and political opponents easy access to a fake judgment of moral equivalence. Trump supporters saw thin masked men carrying sticks when listening to their president’s assessment of violence on “many sides.” Of course, this is distorted and dishonest, but that doesn’t mean it’s not real. Fourth, aggressive and virtually automatic response to the radical right puts a small and mostly marginal assemblage in the driver’s seat. The enemy effectively sets the agenda for antifa, again crowding out room for an affirmative agenda. Fifth, antifa responses give white nationalists exactly the response they seek. The racist right mobilizes around a story of a country that is no longer safe for them, promising young men the chance to fight for their country or their race. Confronting those aspiring fighters with force confirms their story and provides the intense emotional experience they want. It creates drama and produces heroes for the right. (See, for example, the story of “Based Stickman,” who became a meme and a racist folk hero by battling with the antifa in Berkeley.) Violence in the streets invites rather than deters the racist right. Plotting effective strategy means more than making a persuasive moral case against your enemy; it means considering the likely consequences of your actions. If antifa has made a political case for its approach, I haven’t yet seen it. This entry was posted in Uncategorized and tagged Ann Coulter, antifa, Berkeley, Charlottesville, Donald Trump, Ferguson, media, military, Milo Yiannopoulos, Missouri, nonviolence, paramilitary, repression, violence. Bookmark the permalink. Although a non-violent response can be difficult, I agree that violence plays right into their hands and we must resist their basest desire to draw us into their web of hate. Brains over brawn. Thanks for your thoughts. Thanks much for this; it’s compelling writing. But in speaking to “the political effects of different movement tactics,” this series (here and in its first entry) seems to have thus far avoided the issue of what unfolds when armed, potentially violent, and virulently bigoted demonstrators show up in your town or city. (Though this piece briefly acknowledges what happened in Charlottesville, it doesn’t linger on or return to it analytically.) Maybe future entries will move further away from detailing how activists should *not* respond to the racist right, and more toward the title? Looks like it is too late anyway. The Antifa are now being called terrorists, while the White supremacists are not. Moving right along. My own view is that all this stuff has to be contingent. I share David’s view that anything on the progressive side that looks “violent’ will be played badly in the media and thus hurt the cause, and it is my view that the Right is provoking violence for just this reason. But what exactly to do about it to counter these problems is harder to decide. Sorry to be slow in responding to what should actually be an important discussion. The academic’s disability is fixating on the downside of everything, one I’ll claim. My point is not to disparage people who try to find ways to stand up against white supremacy nor to impose a litmus test for all efforts. Rather, I hope that people who want to think strategically will move forward a couple of steps and consider what the likely outcomes of their actions are. As olderwoman suggests, tactical choices are contingent, and trying to export something that worked in a different time and place without considering just what’s different is a mistake. Large events particularly are complicated, when groups of participants with different commitments are enacting very different approaches. It’s worth remembering, however, that in the US a violent profile generally invites government repression, and it’s unlikely to be balanced in any way. Governor Ronald Reagan supported modest gun control measures in California when Black Panthers carried weapons legally. The federal government, through infiltration and violence, pretty much destroyed the Klan and the Black Panthers in the 1960s/1970s, although the racist right probably survived the period better positioned than the radical left. So, Josh asks (here and in linked comments) to consider seriously what happens when organized groups of thugs come to your city and you can’t rely on either their discipline or the response of local authorities. I don’t have an answer that always works best, and don’t believe that every provocation can result in a win for the good guys. That said, you want to develop a set of approaches that you really believe will increase the prospects for your side over the long haul, rather than only provide the visceral satisfaction of fighting back in the moment. and there has not been sufficient outcry about police failures in controlling White racists. Is there a way to insist that the police bring the thugs under control? (2) The harder question is what to do about people with block bloc tactics in opposition to White racists who are not physically attacking people on that day. Or who are trying to provocatively engage White nationalists/fascists. Self defense is a different strategy that constructs a different narrative than aggressively attacking opponents.